Please visit this page for updated staff information. Pam Bryan is one of the founding members of Penn's Corner and she currently sits on the Board as treasurer! Oh, and she runs Pucker Brush Farm in Shelocta, PA where she grows Certified Naturally Grown veggies and, in her free time raises sheep, ducks and rabbits. Tim & Suzanne run the 235 acre family farm in Armstrong county known as Kistaco Farm. Apples are their specialty, but they also grow many other fruits and vegetables throughout the year. We have fallen in love with their delicious apple cider since they joined PCFA in 2003. Visit their website at www.kistacofarm.com or visit the Kistaco Farm Store which is open year round! Scott Farabaugh and his wife, Christy, own and operate Blue Goose Farm in Nicktown, Cambria County. They specialize in potatoes, but they also grow lots of carrots, broccoli, and cabbage (among other things). Blue Goose Farm produce is Certified Naturally Grown. Check out their website at http://www.bluegoosefarmnicktown.com. Sam Byler was a new Penn's Corner member in 2008. Sam along with his wife Susie and their seven children, milk over 100 goats at his farm in Venango County. His specialties are chevre and feta cheese, but he also grows produce for us through Clarion River Organics! Carolyn McQuiston and a few key family members, run Dawson's Orchards in Beaver County. Their specialties are berries and tree fruit. 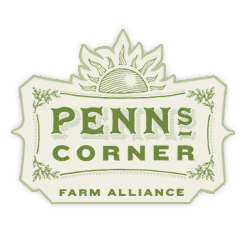 Carolyn's farm became a Penn's Corner member in 2007. Check out their website at www.dawsonsorchards.com or go out and visit their Orchard Market! James and Christine have been farming for a total of 35 years, 23 of which have been at their current farm in Prospect, PA. New to PCFA in 2010, Crighton Farm grows a wide variety of gourmet vegetables; among them are PA Simply Sweet Onions, shallots, peppers, cherry tomatoes and micro greens on their 12 acre farm. The Foulk's farm in Greenville, PA has been in the family name for over 100 years. Bill and his wife Paula specialize in everything garlic, while following organic growing practices. Clubhouse Gardens has been a member of Penn's Corner since 2009. Lori and Rex provide Penn's Corner with a variety of cow's milk cheeses. All of their cheese is made from fresh raw milk from their Jersey Cows on their farm in Everett, PA. Their cows are rbst free and enjoy the free range of grazing the fields. Check out their website at www.hiddenhillsdairy.com for more information! Raymond grows many delicoius things for Penn's Corner on his Farm in Hartstown, PA using all chemical free practices. He has been a member of PCFA since 2008 and even started supplying us with his own maple syrup this year!